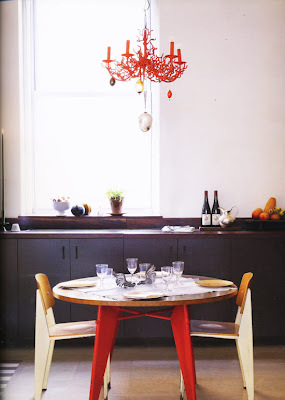 Anita Calero’s loft is one of my all-time, without a doubt, favorite spaces. I’ve filed away iterations of Calero’s home from every shelter mag I’ve spotted it in, and (these are the types of things I do for fun in my rare spare time, in case you’re wondering) I pulled them all out recently to see how it’s changed over time. Sure she’s made some tweaks, added a few lovely things, moved objects around, but (and this is a rare and highly admirable trait in my opinion) her style and aesthetic is so consistent, her vision so clear, that it’s essentially the same space, only better. I feel seduced by the need to “change” far too often…worried that my house will fall into some sort of design rut, like a haircut way past its prime, and start getting itchy to make things look totally different. Usually when I go this route I fail…miserably. Can you tell I’m starting to gear up a bit for the spending hiatus? Objects, experiences and individuals of lasting value…Exactly. Thank you so much for sharing. What an inspiring article and beautiful home. The article was so well written and truly refreshing, it made my day! I love this home. Gorgeous + so you! That fridge is amazing. The article you linked to is fantastic. It resonates with me. Thanks for the post. That's a very inspirational article, and very true. Thank you for sharing! I discovered Anita's home only the other day while reading a magazine borrowed from the Library. I immediately fell in love with her aesthetic and scanned the images into my inspiration file. I too am going on a spending hiatus, inspired completely by you and my credit card bill. It all starts for me 1 Feb, I'm going to aim for a 3 month hiatus. Thank you so much for sharing links to this loft. My goodness, it's just perfect. Her collection of Jean Prouve furniture alone is enviable, and then it's all pulled together with such natural finesse and simplicity that the whole space just feels organically idyllic. Couldn't agree more! I recently moved into a tiny space that forced me to go through EVERYTHING I own. I found by paring down to what I love and arranging it in a new way in such a small space I got the feeling of new by rediscovery the old! Love it. Thanks for the inspiration! i want to make that orange chandelier mine! 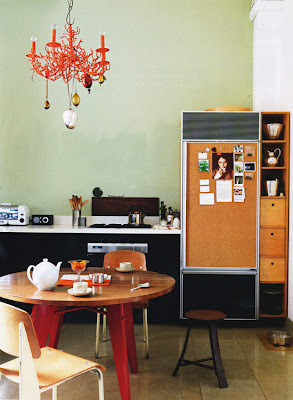 I love the chandelier and what I believe is cork on the fridge--genius! Ah, I love this blog. Just discovered it. What a great source of inspiration. Thanks! 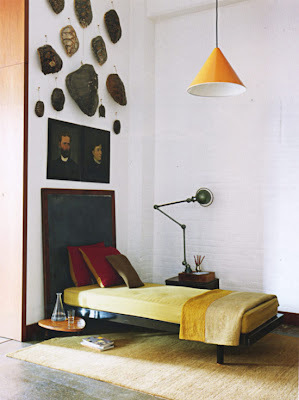 love her place (especially Prouve) and enjoy your blog!